Synopsis: Hella is a great option for driving, fog or black magic lights! 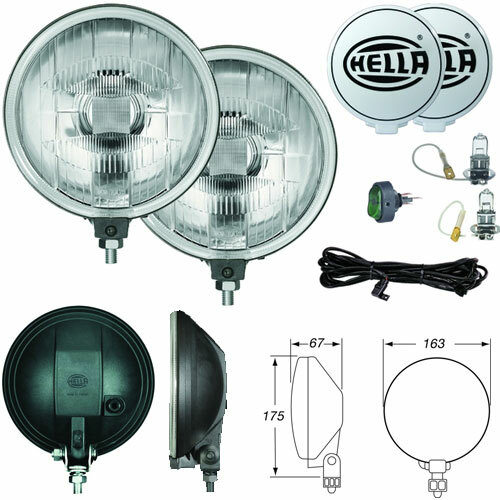 The Hella 500 is a great and very affordable driving lamp that is ideal for mounting below the bumper on Gen 1 MINI's and in front of the bumper on Gen 2 MINIs. Provides excellent visibility on and off-road. Features Slim Line high impact black ABS housing and aluminum vapor-coated reflector. Upright mounting via single stud. We also offer this lamp in a Fog light variation as well. Lamp dimensions: 6 3/8"Dia. x 6 7/8" H x 2 5/8"D.
The Hella 500 Fog lamp is a great and very affordable driving lamp that is ideal for mounting below the bumper on Gen 1 MINI's and in front of the bumper on Gen 2 MINIs. It is actually light enough to also be mounted on a Gen1 MINI using the factory driving lamp brackets that mount through the front upper grill. Check out our lighting section for info on the brackets. The Hella 500 Provides excellent visibility on and off-road and look great when installed on a MINI Cooper. Features Slim Line high impact black ABS housing and aluminum vapor-coated reflector. Upright mounting via single stud. We also offer this lamp in a Driving light variation as well. Lamp dimensions: 6 3/8"Dia. x 6 7/8" H x 2 5/8"D.
These are by far some of the coolest lights around. When turned off, the front lens appears to be black or dark smoked but when you flip the switch you get the full clarity of Hella's finest driving lights. The Hella 500 Black Magic is a nice sized light and are perfect for mounting in front of the grill as well as down low. They are lighter than most lamps that are similar size so they can even be mounted on the Gen1 MINI using the factory driving light brackets that mount through the upper grill. We have those available in our lighting section. If you want to mount them down low in the radiator grill opening, we have a nice set of adjustable brackets available, too.